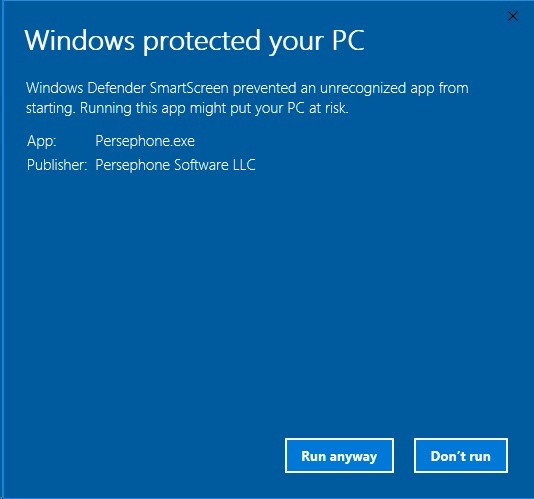 If you have permissions to install the software on your Windows computer, please download the setup program from https://persephonesoft.com/PersephoneSetup.exe. Another method to install Persephone, that does not require administrative rights, is to use the ClickOnce technology. The simplest way is to use Internet Explorer or Edge. In this case, it is enough just to navigate to https://persephonesoft.com/clickonce/Persephone.application. 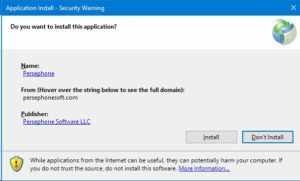 Internet Explorer will automatically try to install Persephone. If, for some reason, you cannot use Internet Explorer, also navigate to the same URL https://persephonesoft.com/clickonce/Persephone.application using your favorite browser. It will download a very small starter file Persephone.application. After that, all you need is to click it to initialize the installation. 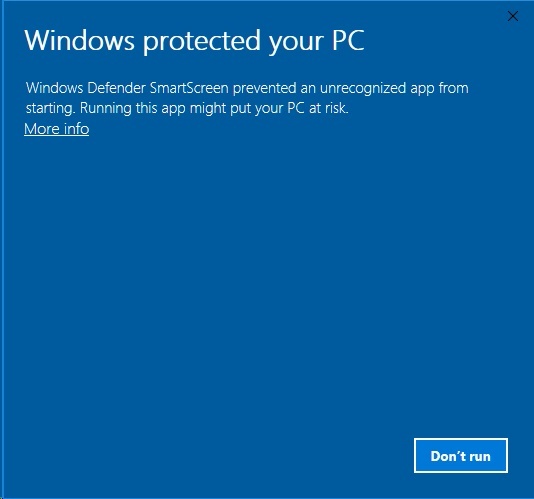 You may see other screens from User Account Control making sure that you trust the publisher Persephone Software. Once installed, Persephone will start automatically. Next time you can launch the program by clicking a desktop icon or by finding Persephone in the Start menu. It will automatically check for updates. 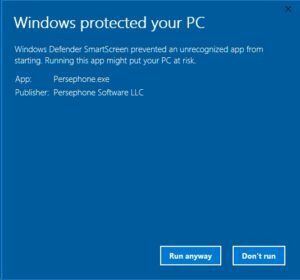 Windows Defender is trying to warn us that PersephoneSetup.exe is not yet in its database, so we respectfully proceed further by clicking More info. 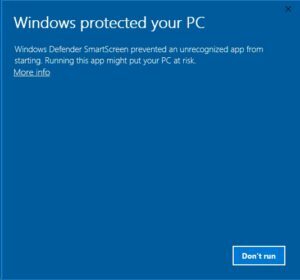 Please note, that Windows Defender recognizes the code-signing certificate issued to Persephone Software LLC. 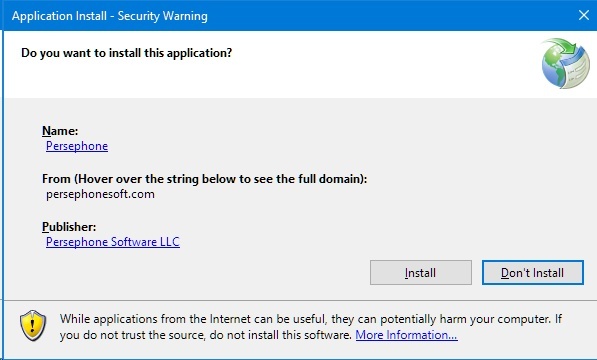 To start the installation please click Run anyway button and answer the questions common for software installation. Please check a quick introduction to Persephone, that should help you making the first steps with the application. A full description of Persephone functionality is presented in detail in our help pages. We would be happy to hear your feedback, and if necessary, we can provide online tutorial sessions. Just let us know by email. Thank you!